The staff over at the Ice Cream of the Month Club have really outdone themselves this month. It's not that the other shipments haven't been quality ice cream, it's just that this month just goes above and beyong with not only unique flavors but unique products. Today's example is goat milk's ice cream. That's right, I can now say I've had goat's milk ice cream and lived to tell the tale. 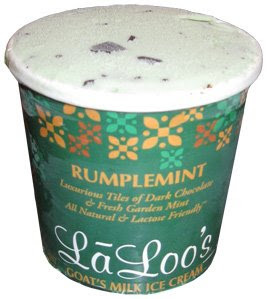 What you see before you is the Rumplemint flavor from Laloos, which is only one of 6 flavors they offer (not including yogurt or seasonal flavors). The description is "luxurious" tiles of dark chocolate and fresh garden mint - all natural and lactose friendly. It's a little hard to tell from the picture, but it is very very green! If I had to describe the flavor, I'd call it an Andes mint flavor, but I mean that in a nice way. A long time ago I had the Walgreens version and I just didnt like it, it was too warm and fuzzy with it's creme de menthe funk to it. Not here though, the mint ice cream and dark chocolate combine for something much nicer. It's pleasant and reminds me of a tasty after dinner mint. I was only going to eat a few bites for my first taste test, but I liked it enough to have a whole serving. Enough with the flavor stuff, you want to know if I started Baaa'ing after I ate goat's milk don't you? Wait, goats don't Baaaa ...or do they? sorry, I don't hang with goats much. Anyway, had I been blindfolded ...I would have never know this was goat's milk. There's no funny taste, nor is there any funny after taste, it's just good old fashion ice cream. The bonus is that apparently goat's milk is good for you, including people with ulcers, and they say it's lactose friendly, so how could you lose? Well, technically you would lose on shipping, but hey, Laloo's wants to be in your local freezer section, so keep an eye open and give it a try ...it won't kill you! or make you go Baaaaaaaaaaa! On Second Scoop: I wasn't sure what to eat after mowing, so I decided to try a few more bites of Rumplemint ...yeah, those 3 bites turned into about 30 bites. I'm not a huge mint fan but boy was this hitting the spot. I love how they keep that menthol-i-ness to a minimum, it makes the ice cream way more enjoyable, especially after it melts just a smidge and you just can't stop going for more. UPDATE: Shaws now carries Laloo's! There is only one "little" problem ...$6.99 a container!!!!!!! Just found this today, along with a Gelato Fiasco Dark Chocolate Caramel Sea Salt Gelato (yeah, my grocery bill was fun) and it reminds me of my all time favorite ice cream: Mint Chocolate Chip from Baskin Robbins. The texture is creamier and smoother, more adult-like maybe with the larger chunks of chocolate. Now I have to go put it back in the freeze before it disappears.